Dip, cut side down of peaches, in butter. Place cut side down on low heat on the grill until slightly brown. Beat the remaining ingredients together with a mixer until smooth. 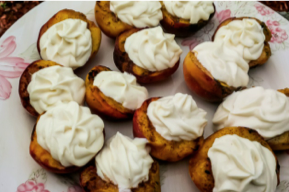 Place a large dollop of mixture in each peach center.